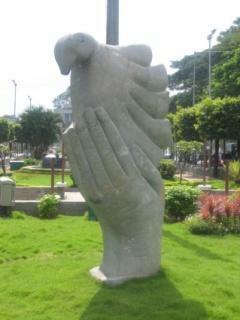 In Bengaluru’s common spaces, an array of sculptures are placed in various venues, from street corners and traffic circles to important expanses of municipal land and strategic corners of private property that have large, open frontage. What kind of sculpture sits in these spaces? Is it always art and is it always public? A journey through the streets suggests that big questions about the politics of art and the poetics of the public are available for discussion in every neighbourhood. The artist places the work to initiate a very large dialogue in common space. Most of Bangalore’s public sculptures, on the other hand, are not installed to initiate dialogue; instead, they are proclamations by their sponsors and the audience reaction they wish to incite is veneration. 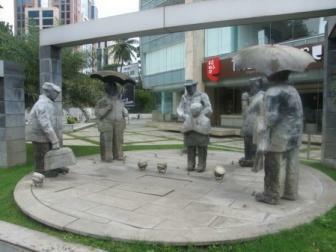 Public art sculptures are designed to be situated and seen in the public domain. In Bangalore though, most of it is not the variety that involves curators or emerges out of critical working practices. Community involvement and collaboration happen, but on terms very different from what public art curators and makers usually imagine. Modern film actor Rajkumar in the realm of the epic and the historic. Pic: K Mohan. 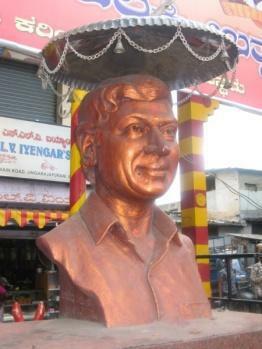 The Rajkumar statue was installed by the Gangambika Kannada Youth Society and the village residents of Kariyannapalya in Lingarajapuram. The bust of Rajkumar is painted a coppery-bronze, historically a prized material for statues that move in streets as festival images. He is also shaded by a chattra or parasol, an object that in our culture is associated with a noble personage who is served by his followers so that he can protect them as their chattrapati or “lord of the parasol”. The Youth Society and the village residents extol him using the titles he received in his lifetimes, “Gem of Karnataka” and “Padmabhusana”. Bronze, parasol and titles come together to place the modern film actor Rajkumar in the realm of the epic and the historic. The Virgin Mary is a different story. 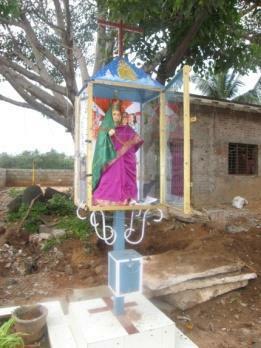 This shrine in Lingarajapuram is like many others that arrive on the sidewalks in the days before the Feast of St. Mary. Many such figures go back inside after the feast but others do not; they stay on the sidewalk and become shrines. This Mary is dressed festively and stands carrying her baby, Jesus. She is the quintessential mother and her presence on the street is a sign that she is able to give benedictions and receive worshippers’ prayers even if he or she is not rich or able to go to a big cathedral. Virgin Mary festively dressed holding baby Jesus in Lingarajapuram. Pic K Mohan. Such Mary figures often are placed in glass cages; she may be there for members of the public who seek her out but the person who erected this shrine also wanted to protect her, aware that a figure on the street is vulnerable to damage and violence. This particular one has already been removed from the street, the day after the photograph was taken for this article! These two sculptures are generic; they are not “authored” by any artist, though the people involved with installing them must know the artists or may have even been involved in making and displaying them. Many areas of Lingarajapuram are populated largely by Tamilian immigrants who are mostly lower class. The entry of Rajkumar in such a space is an attempt to secure Kannada identity. The Virgin Mary is part of the growing culture of appropriating government or civic amenity land for private agendas that can only be activated in common spaces. Sponsors often locate their sculptures in such spaces because their economic status does not allow them to create privately-owned, large commemorative spaces, like the Shiv Mandir on Old Airport Road. The generic sculptures at Tiffany Square on Vittal Mallya Road are safer; on the corner of the street facing Kasturba Road and Cubbon Park, five male figures partially encircle a boy who appears to be praying. Every time the water turns on, the figures get drenched. The sculptures do not look particularly Indian and the scene could be from and for almost any city in Europe or the Americas. This is in keeping with UB City’s owners’ desire to project their real estate project as bit of a cosmopolitan elsewhere in the heart of Bangalore. Three other public sculptures are commemorative, whether they served an empire or represent a state. A marble Victoria stands arrogantly holding symbols of power; her location at the beginning of the parading area must have once invoked great pride among those Britishers who served her in India. She represents one of the last public reminders that Bangalore once was a colonial city. Kempegowda and Rani Chennamma are statues erected to remind Bangalore and Karnataka of the city and the region’s pre-colonial greatness and anti-colonial resistance. The installation of such figures in the decades after Independence is both a sign of sovereignty as well as an attempt to represent different classes, regions and interests in a city that is also the state’s capital. The Chennamma statue is particularly interesting since it takes the commemorative equestrian statue made familiar to us by the British and places it on a modernist fountain instead of the usual pedestal. Such mixing of styles is familiar in the public sculptures in our city where the fountain becomes the space for showing off modern waterworks while the statue follows the physiognomic realism (The art of judging human character from facial features) taught to Indian artists in the colonial art academy. Thiruvalluvar statue was established as part of cross-state diplomacy. Pic K Mohan. The Thiruvalluvar statue in Ulsoor and the Sarvajna statue in Chennai reminds us that when we think of public sculpture, we must remember that the local is connected to the regional, the national and the international. These statues have been established as part of cross-state diplomacy between Karnataka and Tamil Nadu. Each gave the other a poet-philosopher; it is remarkable that even today, it is the figure of the poet the modern state uses to best represent itself to its rival. 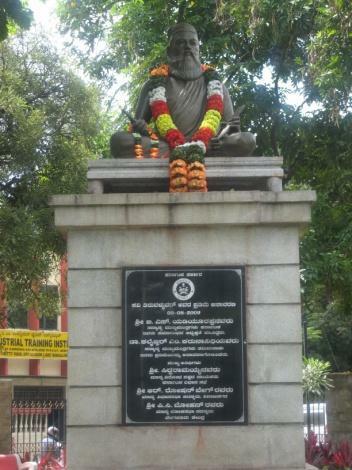 As is well known, the Karnataka government refused to unveil the statue until the Tamil Nadu statue was installed. What about the sort of sculpture or public art that we find in European and American cities? In Bangalore, as in the rest of India, there is precious little. Renowned sculptors like Nagji Patel and Balan Nambiar have bemoaned the lack of interest in the public and private sectors and even among architects in creating spaces for sculpture. Whatever is commissioned is often ill-maintained and sometimes removed. This is partly because of the gap between what the artist is interested in making, what the patrons is interested in funding and what the audience is interested in seeing. The public statues of Bangalore discussed in this article clearly indicate that public debate and discussion is already happening, indeed is embedded in the statues. The goal now is to broaden the range of art forms and practices through which debates enter our common spaces. Sculpture park in the city. Recently, a contemporary sculpture park has been developed near the Chennamma statue, adjacent to Town Hall. This was earlier in ruins and was infamous for various nefarious activities. During the planning stages, there was some debate about situating the sculpture park here since there was also a desire to install a statue of Rajkumar; some officials felt there would be a clash of styles. In any case, the sculpture park now hosts sculptures made by well-known Bangalore sculptors, though it is always locked and inaccessible. Such circumventions of intention are common; people who initiate such projects want the attention of the city’s residents but only from a distance. The works are too valuable to become subject to potential vandalism and too complex sometimes for easy comprehension and unmitigated admiration. Based on what the author discovered while conducting research in Bangalore under a grant she received from India Foundation for the Arts.